The SureCall CM2020 80dB is the most powerful linear amplifier in its price range on the market today. It extends cellular services in poor coverage zones where the signal is weak due to topography, building materials or structural design. SureCall wireless signal booster is full-featured amplifier includes adjustable gain control and automatic shutdown for maximum flexibility. 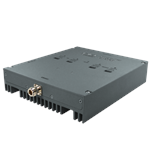 Ideal for locations with a low cellular signal and/or requiring large coverage. Covers up to 80,000 square feet. Supports multiple simultaneous callers using different carriers. FCC WARNING: This is NOT a CONSUMER device. It is designed for installations by FCC LICENSEES AND QUALIFIED INSTALLERS. You MUST have an FCC LICENSE OR express consent of an FCC Licensee to operate this device. Unauthorized use may result in significant forfeiture penalties, including penalties in excess of $100,000 for each continuing violation. Cellphone-Mate 100 FT CM400 Ultra Low Loss Coax Cable with N-Male connectors. Finished cable with N-Male ends. CM400 is equivalent to LMR400 coaxial cable.